Catequesis is a survival horror game based on 90's RPGs gameplay, with a really strong and immersive story & a 8 bit graphic style. This game will be released for Android, PC, Mac & Linux. Hi there, Maxime here, developer of Catequesis. For my first post, I'll talk a bit of what's under the hood of the Catequesis project. Hi there, Maxime here, developer of Catequesis. For my first post, I'll talk a bit of what's under the hood of the Catequesis project. I'm a Java developer so Java is the language used in every components of the Catequesis project. It's definitely a good choice for targeting Desktop and Android ( and even web, but this is another topic ). 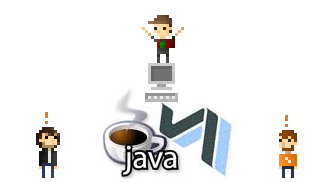 Java is a rather modern language, that can run on many platform. It's object oriented (which is really great for games), has a really huge ecosystem, and focus more on productivity than performances ( which is good enough for a 2D game ). The game itself. Android code and Desktop code differs on some specific platform related issue, but most of the code is the same between the 2 platforms. That's a huge advantage. The editor : We got a great map editor that allows us to create maps the way we want without requiring any code knowledge. Tools : There are some inside tools dedicated to automation of dull tasks. People : us, basically. I should have put people on the first point though ! A question that we're often asked is : "Which framework do you use?" followed by "Really ?! But why did you have to recode everything rather than using a game framework ?". You have already guessed that, in Catequesis, everything is home-made. My game framework is something I started to develop 3 years ago, for fun. I wished to learn how to use OpenGL. At that time I decided to build a little game that leads to the creation of Tales of Pocoro. In 3 years, the engine got bigger and better. It's not that hard to code, but just take time to read, experiment and implement. When Francisco asked me to develop Catequesis, I already had my own engine, with a light editor. So, for me it was easier and more interesting to use my own tools and improve them rather than starting from scratch using a game framework. The editor is full Java, and uses Swing. The game uses JOGL, a library from Jogamp, that allow Java use OpenGL in a very low level way, pretty much the same way you can use OpenGL on Android ( which is really convenient ). On the desktop, the sound is handled by JOAL, another library from Jogamp ( love you guys <3 ). Every library we use is open-source. If you have questions regarding this, do not hesitate to ask in a comment. I'll be glad to answer. Well, that's something to ask to our artistic director. I'm not against the idea but i'm afraid we don't really need an extra hand. I'll poke him to answer you. I sent you a message pal. More incoming, we've got a lot of content but we won't show everything in one shot.